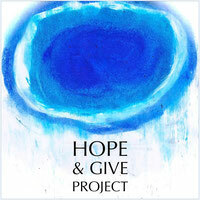 lottery 12 - hopeandgives Webseite! "My hope is for a better understanding and expression of unconditional love. Of each other, and of the earth." We will send a few questions to Douglas. The first painting is for Douglas himself to keep and the second painting will be given away by Douglas to someone he wants to communicate with about their hopes. Please be so kind to spread the word.